Quinoa is very light, so it’s great if your system is feeling sluggish. It’s also a complete protein, so it makes a wonderful breakfast. It doesn’t have quite the creamy flavor of oats, so add other ingredients as you wish–there are no rules, you can change the flavorings as you like. You heard Anjum. There are no rules. So go ahead, bring some whimsy to your breakfast. That includes relying on your old reliable oatmeal toppers, whatever they may be. We’re partial to a drizzle of honey and some dates and walnuts. Or dried cherries and pumpkin seeds. Golden raisins and almonds are nice, too. As are bananas and cashews. But that’s just us. Certainly you can fill in a few more companionable stir-ins. Care to share? 1. Place the quinoa, milk, and water in a tall-sided but small saucepan. (If using soy milk, don’t add it right away; instead, add it to the quinoa and water during the final 10 minutes of cooking.) Bring the mixture to a boil over medium-high heat. Drop the heat to medium-low, cover partially, and cook, stirring occasionally, for 15 minutes. 2. Add the dried fruit, spices, vanilla extract, and orange zest, recover, and continue to cook just until the quinoa is soft and the little curlicue on each seed becomes pronounced in appearance, about 15 minutes more. If the pan looks dry at any point, add a splash of warm water. 3. Before you pull the pan from the heat, adjust the consistency of the quinoa to your liking. If it’s too soupy, evaporate any excess liquid over high heat. If the quinoa is too dry, add a splash of warm water or some more milk. 4. Remove the pan from the heat and sweeten the quinoa to taste with maple syrup, honey, or agave nectar. Sprinkle with the pumpkin seeds. 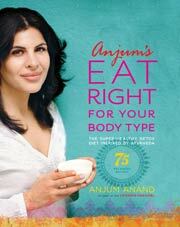 Breakfast Quinoa Recipe © 2011 Anjum Anand. Photo © 2011 Lisa Linder. All rights reserved. All recipes and photos used with permission of the publisher. What a delightful change for breakfast cereal. Lovely bursts of cinnamon and orange zest throughout, and studded with sweet, chewy jewels of dried fruit. I made a minor change when making this by adding all almond milk instead of using water, as this is how I make my regular oatmeal. I am glad I did, as this might have been more watery tasting without that change. The quinoa has a nice, slightly chewy and creamy texture, and I was pleased that I didn’t have to boil away any extra liquid. A definite make-again for the extra protein for breakfast. If this tells you anything, I have already committed this recipe to memory. At first, I was a little irked with this recipe because it doesn’t tell you what heat to use, but I got over it once I realized how delicious and how filling this oatmeal — er, quinoa — is. To get the perfect, creamy oatmeal/quinoa, I started it over medium-high heat, then I dropped the heat to medium-low and let it go, stirring occasionally, until the oatmeal/quinoa was creamy and thick. If the heat is too high, the liquid will evaporate too quickly and the result won’t be as creamy, but it will still be delicious. We’re a two-milk family, so I gave this recipe a whirl with both cow’s milk (his) and vanilla-flavored almond milk (mine). Both were delicious. I thought I could omit the vanilla for the version with the vanilla-flavored almond milk, but it turns out that a drop or two helped. And please add the star anise, but remember to remove before you start to eat. It looks startingly like a raisin. Speaking of raisins, two teaspoons just aren’t enough. Two tablespoons ensures you get a raisin in every bite. This is a great way to eat quinoa. I have only tried it in savory dishes in the past, but this was a very good, very filling breakfast. I liked that the sweetness of the spices makes the quinoa sweet, even without the addition of maple syrup, agave or honey. I also enjoyed the texture that the pumpkin seeds added. Since my time on work mornings is limited, I would probably quadruple the porridge portion of the recipe so I could reheat leftovers throughout the week and then add sweetener and seeds to taste each day. One caution: Be sure to turn down the heat on the quinoa/milk/water mixture when you bring it to a boil and then partially cover it. I have had many messy boil-overs in the past from leaving milk on too high of a heat once it comes to a boil. I’ve made this several times over the last couple of weeks. I didn’t ever use the star anise (not my favorite spice), but I rotated through several different dried fruits and sweeteners until I found my favorite combo. I think the recipe works great as written, but it is perfect for adaptation. I prefer to add chopped deglet noor dates, cinnamon, and a tablespoon or so of Grade B maple syrup after I’ve taken the “oatmeal” off the heat, but try this out and find your own favorite version. This warm breakfast cereal makes a satisfying amount for one person. It provides a hearty flavor with a creamy texture. I used almond milk in mine, and it came out perfectly. The star anise gives the quinoa a depth of flavor, while a drizzle of maple syrup keeps the breakfast flavor intact. Next time, I might use less orange zest and experiment with pecans and a touch of nutmeg. This is a great way to prepare quinoa and prepare for your day. I really had to watch the initial boiling point of the almond milk, water, and quinoa. It took a bit to bring it to a simmer, but get distracted for a second during that process and it could boil over. 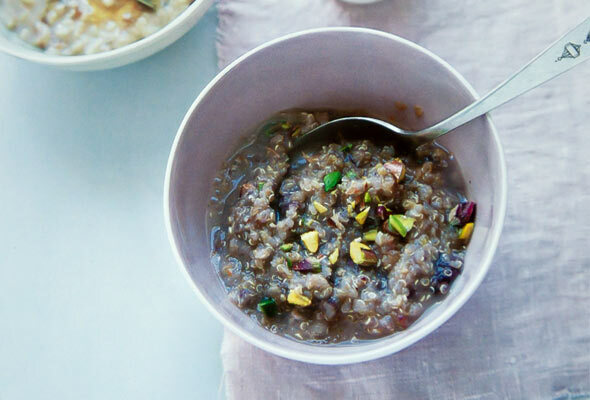 This recipe produced a flavorful hot cereal that retained a bit of chewiness — a plus for me since I LOVE steel-cut oats. I used dried cranberries in my version and these, along with the orange zest, obviated the need for any additional sweetener, in my opinion. My one criticism would be concerning the amount of cinnamon called for — I used one-quarter of a teaspoon, and that was plenty. A great alternative to other hot cereals. This is a nice alternative to oatmeal. I would make this again, with the following changes: I would put the quinoa and water in a tall pan and bring it to a boil. Let this bubble for 15 minutes (you may need to adjust the heat every now and then). I didn’t find the need to cover the pan. Then add the milk, dried fruit, spices, vanilla extract and the orange zest. Bring this to a boil and reduce to a nice simmer. Watch as the milk likes to bubble up. Give it a stir every now and then. Let this cook for the remaining 15 minutes. I didn’t need to add any additional liquid. We sweetened it with brown sugar, as the honey didn’t seem to add much to the taste. The texture was really creamy. Next time we might add coconut flakes and sliced almonds. I eat oatmeal every day, always with brown sugar and cinnamon. It does get a little boring, though, so I was excited to see this recipe. I made mine with warm water and soy milk, but left out the pumpkin seeds, as I am not a fan. I imagine that toasted slivered almonds would be a great alternative. This was easy to prepare, economical, and a very nutritious start to the day. It was delicious too, but I have to admit, I missed the thicker texture of my oatmeal. This is much looser and has a more “airy” quality. If you are looking for a straight replacement for oatmeal, this is not it. But if you are looking for a creative way to get in a great grain, try this! This recipe was simple and doubles well. If I was going to be spending 30 minutes cooking quinoa, I figured I’d get more than a serving out of it. It did extend the cooking time closer to 45 to 50 minutes to get it to the consistency that I prefer for my oatmeal, but the final flavors worked well together. Next time I might start out with a little less water and milk to cut down on the cooking time, since the quinoa was plenty soft after 30 minutes. I used unsweetened coconut milk and dried cranberries, but did without the star anise. Made it the night before, and it tasted great the next day. Thank you for this quinoa dish. I love it, but have not found a lot of recipes for it. I will give this a try this week. Happy New Year! Let us know your thoughts, and what toppings you tried, Lin! I love quinoa for breakfast, and in fact, I created my own recipe a year ago. I love it cold, with Greek yogurt, honey, golden raisins, slivered almonds, and dried blueberries. It’s now a ritual to make it on New Year’s Day. Hi Lydia, your recipe looks great. Although I’m a fatty fat fat kind of breakfast eater (eggs, ham, sausage, bacon, etc. ), I have to say I was quite surprised by this recipe. Quite refreshing. Mmmm so delicious – that list of ingredients she adds to the quinoa. I grew up loving a huge bowl of hot oatmeal – never thought of quinoa this way but now I must try! Hi Jamie, please let us know how you like the quinoa. A possible new favorite? Hope so. I love steel-cut oatmeal, too. It takes being open to a new kind of cereal and taste, but I have grown to like my quinoa concoction a lot. Definitely tinker with the amount of honey and add-ins! I was thrilled when I got this recipe from David on StumbleUpon. After the last month of rich foods it seemed a perfect way to begin the new year and a new day! I made it today using dried cherries for the raisins, adding crystallized ginger and following the rest of the recipe. It is such a warming, filling dish without being heavy and with quinoa being a complete protein I think it’s perfect to start a cold weather day. Thanks for featuring such a great recipe. Our pleasure, Toni. Thanks for chiming in. We, too, love that you can just sort of play loose and easy with the toppings depending on your mood. Let us know of other tweaks you make to the stir-ins as the days and weeks go by. Also, we looooooooove your blog! Love how easy quinoa is to make for breakfast, lunch and dinner. The fruits and spices in this breakfast quinoa sound so good – will have to give it a whirl! I like the new slideshows, but what happened to the “Print Post” button? Hi CEB, the print post button is now bundled with the other buttons to the left of the screen. It’s the top one. If you look at the the row of buttons on the left, there is a small printer symbol above the facebook and twitter buttons. Sorry for any confusion! Thanks so much to you and David for taking the time to help me with this! I finally found it after going back and forth between computer and iPad and changing some settings. Technology is not my strong point. Thanks again!!! I find that Quinoa is the perfect addition to rolled oats for a fast and delicious breakfast with high nutrition. For me, it’s a half-cup of rolled oats, 2 Tbsp of Quinoa and 12 oz. of water. Bring quickly to the boil then simmer until desired consistency is attained. Top with 1/2 Tbsp of maple sugar. Easy, filling, and good for you. I really like the sound of that, Norm, and am going to give your version a whirl…thanks!